8th Bn, The Devonshire Regiment, 20th Brigade, 7th Division, B.E.F. Harry Beale was born in Harrogate in 1880, the son of the late Walter and Caroline Beale who at the time of his death lived at Ure Bank, Ripon, Yorks. On the 1901 Census Harry Beale was a footman to the Shakerley family at Grove Park, Budbrooke near Warwick. His parents at this time lived at 14 Industrial Terrace, Ripon. Like many domestic servants he went on to run his own establishment, the the Rockburn apartments on the corner of Como Road and Victoria Road. His wife, Ruth Beale gave her address during the war as 2 Rostherne, Upper Howsell Road, Malvern Link – presumably they gave up the apartments when Beale enlisted. In 1917 the Malvern News reported: “Private Harry Beale, a well-known resident of Malvern, was killed in action on May 9th 1917. Prior to enlisting he resided at Adelaide House, and previously for eleven years at “Rockburn” taking over the latter from his uncle, Mr T. Gatward, now of the Montrose Hotel. 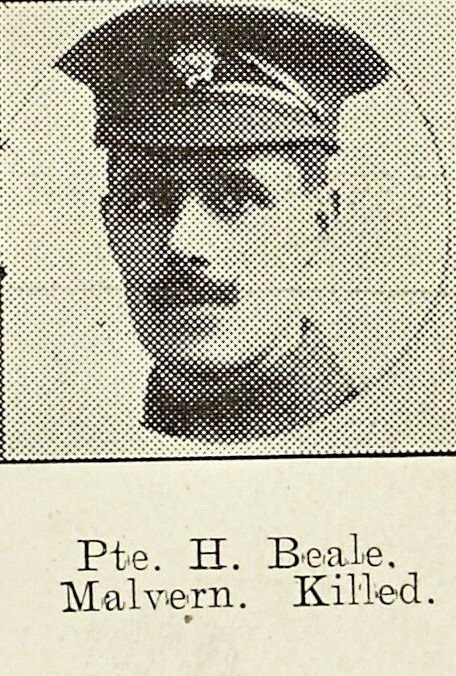 Private Beale who was 38 years of age was home on final leave in February and afterwards rejoined his Battalion in the south of England, where he remained until the middle of March, when he went to the front, being attached to the Devonshire Regiment. “He was struck in the head while carrying bombs, and was killed instantaneously. A brother, a Sergeant in the Royal Scottish Fusiliers, was wounded in September last. The wife of the latter died the same day, leaving two sons ages 8 and 9 respectively. Of his brothers and sisters – Miss Kate Beale married Mr Thomas Galensby Burrill at Malvern Baptist Church in June 1918 (she was the second daughter Mr and Mrs Beale). Her brother, Mr H E Beale of Walmer Lodge gave her away and she was attended by her sister Miss Mabel Beale. The couple were presented with a cheque from another brother, Mr A Beale.